We food bloggers must be a crazy lot, and I’m guessing I’m not alone in my madness. Typically I’m described as happy, sweet, and even nice really. That is until I get into a kitchen. Then I turn into General Flowers, and all those within earshot become my reluctant and somewhat terrified minions. It takes an Army to run a food blog, and until I get paid for this, my Army happens to be everyone I can lure into my kitchen with the promise of a free meal. This all began about a year ago, when I decided visually documenting some of the food I made might be a good idea. Then I reached a fanatical stage where I wanted to document most things I made. Subsequently, I realized I needed recipes recorded. What good are pictures without recipes? So here I am, crazy but fulfilling a fervent addiction. I’ll disclose more about my poor frightened family and friends in my next post. For now, let’s focus on this pizza! Oh, this pizza! So chewy, salty, creamy, mildy sweet, and so pretty! It convinced even the stubborn friend, who hates sweet on their savory food, that they were wrong. Very wrong indeed. Mix all the ingredients, except nutmeg, in a sauce pan and cook on medium low heat. Stir constantly until thickened. Remove from heat and stir in the nutmeg. Set aside. 1. Make the Alfredo Nutmeg Sauce. 3. Cover a plate with two paper towels, lay on the bacon, and then cover with another paper towel. Microwave for three minutes. Carefully flip the bacon over and microwave for another three minutes or until crispy. Pat off grease and cut into bite sized pieces. Cool and cut into chunks. 4. Brush the pizza pan lightly with olive oil and sprinkle with cornmeal. Stretch and roll the dough and place on the pan. Brush with 1 Tablespoon olive oil. Spoon on as much Alfredo Nutmeg sauce as desired. 5. Top pizza with the mozzarella, bleu cheese or gorgonzola, baby arugula and spinach mix, chopped bacon, sliced figs, and Parmesan Reggiano. Drizzle with honey and sprinkle with salt and fresh cracked pepper. 7. Let rest for about 5 minutes. Cut into wedges and serve. The combinations of ingredients should be terrific together. Blue cheese can be tricky because it can overwhelm a dish, but it looks as though you have it under control. I agree. A little goes a long way. I recently made a pizza with fig too, and while it sounds crazy, its so good! I see we're partners in pizza on Foodgawker. I want yours! Laura, the other day I told my husband I was too busy working on my food blog to cook!! He finally asked if he could have what I was making for my blog, so I gave him mini rhubarb coffee cakes! We ended up going out for a famous bison burger. Your pizza looks incredible. Roflmao Ginger! That is hilarious. I figure there are a ton of fun stories out here in the blogasphere like ours. Thank-you everyone. I hope you enjoy this one! Hi Laura, thank you for commenting on my Nutella Bon Bon! Tea biscuits...are square and comes in a package of different sizes. All is written on the package is TEA BISCUITS! Vanilla flavor...if you can't find them, use "Animal Shaped Cookies" for kids. Taste the same but different shape and size. Ha! You and I (and as you say most food bloggers!) are exactly alike. I can't lure anyone in to help me anymore as I get bossy and panicky all at the same time. I love making pizza and do it almost every week, but I always stick to the usual tomato sauce-mozzarella-arugula-grilled veg topping. Your pizza looks amazing! I want a piece, too! I'll bet that sauce with that combo of flavors was fabulous! So true about food blogging taking an army! 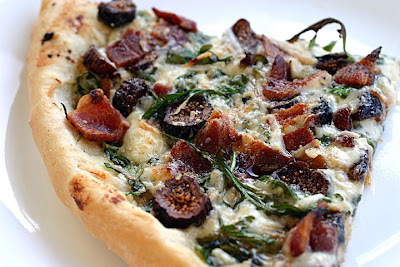 I love the idea of figs, gorgonzola, and bacon together in one scrumptious bite. It's the perfect combination of sweet and salty. A must try. Thanks! mmmm figs on a pizza sounds fabulous. figs on anything sounds fabulous. There's nothing better than homemade pizza with bacon! Looks great! Trying this next weekend - I have fresh figs from the tree in my parents' yard so I'm going to try it w/ those. I hope you like it Suz. This one is one of my favorites. Oh, and I am jealous of your fresh free figs! !